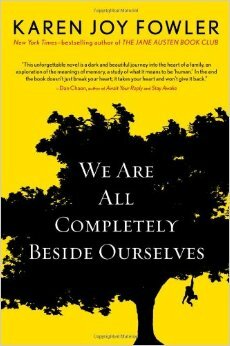 We Are All Completely Beside Ourselves by Karen Joy Fowler was recently short-listed for the 2014 Man Booker Prize for Fiction. After motoring through the book, I understand why. This is a very original story told in the first-person by a woman named Rosemary who was raised alongside a chimpanzee as a psychological experiment. What Rosemary was too young to understand was that the chimp was not her “sister”. When Fern, the chimpanzee abruptly disappears from her life, Rosemary spends the rest of hers wondering how and why her “sister” inexplicably vanished one day. I think this is a great book because of the many layers of thought which have gone into it and the way in which they are presented. I’ve told more that I think I should have already about this story, but I hope it will entice my followers to read it. It really made me think about many issues beyond living with a chimpanzee. Great story! This entry was posted in Uncategorized and tagged animal rights, Books, chimpanzees, fiction, Karen Joy Fowler, Man Booker Prize 2014, We are all completely beside ourselves. Bookmark the permalink. Thanks for the review – I was wondering what the storyline was, and now I know. A very interesting story to develop. I don’t think the book has hit our shops yet, but fingers crossed. I think you will enjoy it when it becomes available in your neck of the world! Thank you for your comments! I enjoy your website very much, but I’m so glad I read this book before reading your review. Revealing that Fern is a chimpanzee is quite a large spoiler, and I’m so glad I didn’t know about it before reading the book. I agree, knowing the “sister” is a chimp prior to reading this novel would/could take the suspense from it. The book jacket was a dead giveaway. I am glad you did not know the plot in advance!